This Palram 6ft x 12ft Skylight Plastic Garden Shed provides a large and secure space to gardening tools, outdoor furniture, bicycles and other household items. The aluminium framed double doors provide easy access to the plastic shed, ideal for storing and retrieving larger items. This shed features an innovative slide and lock paneling system for a straightforward installation. Made from lightweight, UV treated polycarbonate panels and reinforced by robust aluminium framing for a strong build. 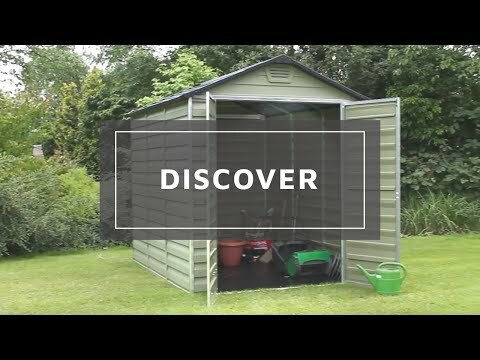 The UV treatment prevents the polycarbonate panels from discolouring and cracking over time, so you can be confident that this garden shed will look great for many years to come. This Waltons plastic shed is supplied with a 10 year manufacturer’s guarantee and features a low maintenance design. 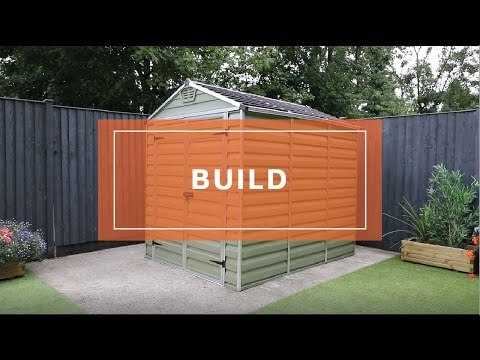 For additional strength and weather resistance this garden building can be bolted down to a solid, concrete base. An anti-slip floor will keep your belongings dry and ensures safe use. The unique, skylight roof panels allow natural light to filter into the storage shed, whilst maintaining an opaque exterior, keeping your items secure and out of sight. Integrated vents encourages air circulation, helping to prevent the build-up of condensation to protect your items from potential damage. A pad-bolt is supplied to ensure that all your items are kept secure. We highly recommend that you construct the plastic shed onto a firm, level ground such as concrete or paving slabs. Review:Flimsy and overpriced.Not what I expected. Thank you for your feedback. I am sorry that you are not happy with your purchase, can I suggest that you give our customer service department a ring on 0800 029 1000 and let them see how they can assist you. Thank you for your feedback, if you do require any further assistance with your Skylight Plastic Shed with Free Floor please do let us know. The office telephone number is 01636 880514. Fantastic! Great to hear you are pleased with your Green Skylight Plastic Shed. Review:Lovely size but quite lightweight, so moves in the wind as not yet bolted to the floor. I am glad that you are pleased with your plastic shed and I am glad that it is suitable for your needs. Thank you again for your review! Review:Instructions mostly good, just a couple of places where they could have been clearer. Definitely a two if not three person job to assemble and keep steady. Roof joints will let in water if not properly sealed. Once assembled though, it's brilliant! Review:Bit fiddly to erect and some small screws missing but managed to use some that I already had. When erected seems fairly strong and stable. Definitely needs 2 people to erect. Review:Shed is flimsy. Difficult to hang things inside. Moves a bit when windy.